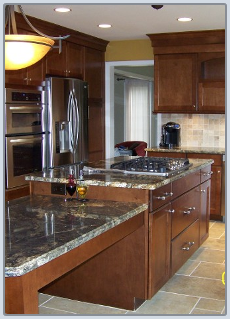 WE ARE RANKED AS ONE OF THE BEST BATHROOM REMODELING COMPANIES IN CANTON MICHIGAN. 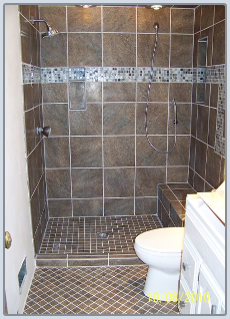 WE HAVE BEEN PROVIDING COMPLETE BATHROOM REMODELING AS A BATHROOM REMODELING CONTRACTOR IN CANTON MICHIGAN SINCE 1993. 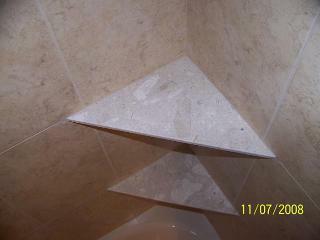 WE ARE YOUR LOCAL BATHROOM REMODELING COMPANY. FROM SMALL BATHROOM REMODELING TO LARGE BATHROOM SUITES. 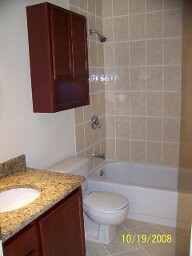 WE ARE BATHROOM REMODELING BUDGET FRIENDLY. SOME BATHROOM REMODELING TASKS CAN BE LEFT FOR YOU TO SAVE MONEY ON THE BATHROOM REMODELING COSTS, SUCH AS DEMOLITION OF THE BATHROOM OR PAINTING OF THE NEWLY REMODELED BATHROOM. IF YOU ARE A HANDS ON DIY TYPE OF PERSON, WE CAN WORK WITH YOU. MARBLE AND GLASS TILES IN A SUBWAY TYPE LAYOUT. GLASS VANITY IS LIGHTED FROM UNDERNEATH. CUSTOM BUILT SHOWER TO FIT BEHIND THE BATHROOM DOOR. 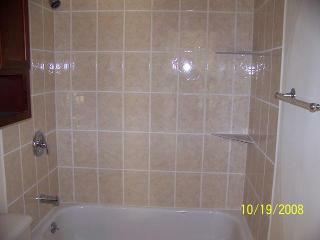 This Plymouth Michigan bathroom client wanted a shower instead of a bathtub. We removed the bathtub and created a walk in shower. The valve is actually mounted in the wall. 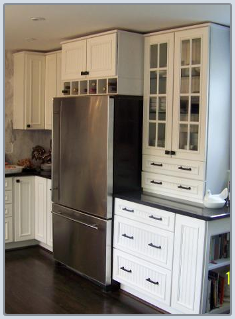 Custom wall niches one him and one for her. 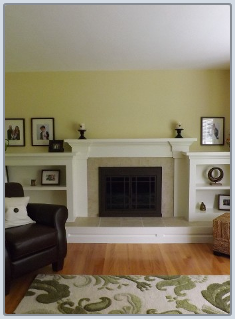 Ceramic tile selected has a coarse finish to reduce the chance of a slip underfoot. The bathtub was removed to make room for a shower. 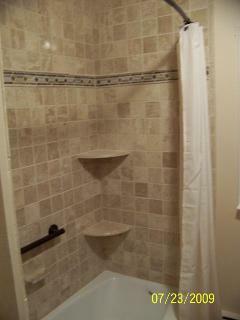 The shower has a seat and a hidden from view wall niche for the kids. Glass tile boarders in the walls and in the floor. Custom built vanity cabinet complete with a foot stool that stores in the toe kick area of the bathroom vanity cabinet. 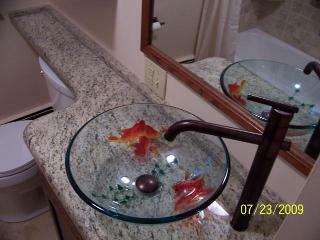 Granite runs as a divider from the bathroom vanity over into the shower half wall. THE BATHTUB WAS REMOVED AND MADE ROOM FOR A SHOWER IN THESE TWO CANTON MICHIGAN BATHROOMS. 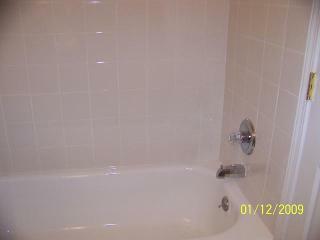 BOTH OF THESE BATHROOM REMODELS USED A FIBERGLASS SHOWER PAN AS THE BASE. THIS CHOICE OF SHOWER BASE HELPED TO KEEP THE BATHROOM BUDGET AFFORDABLE. 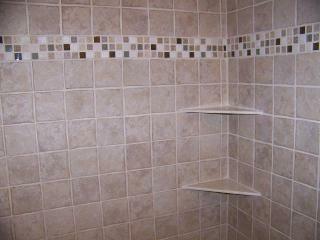 THE OTHER SHOWER HAS A WALL NICHE FOR STORAGE. 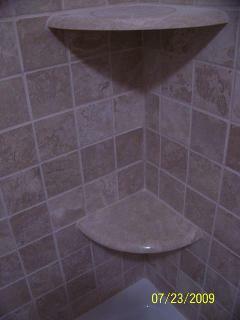 BOTH BATHROOMS WERE REMODELED USING CERAMIC TILE. 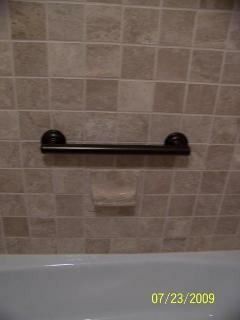 GIVE US A CALL, WE ARE YOUR LOCAL PROFFESIONAL BATHROOM REMODELER IN CANTON MICHIGAN. VANITY REUSED TO SAVE $ WITH A NEW TOP. TILE INSTALLED IN A SUBWAY LAYOUT. 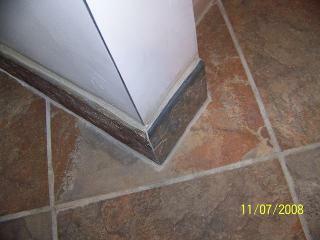 FLOOR TILE IN A DIAGONAL LAYOUT. THE LAYOUT OF THE TILE IN THIS BATHROOM CREATES THE ILLUSION OF MORE SPACE. BY CREATING CONTINUOUS HORIZONTAL LINES THE WALLS GET PUSHED AWAY. 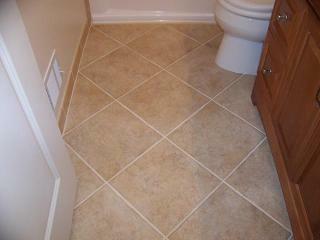 THE DIAGONAL PATTERN OF THE BATHROOM FLOOR TILE CREATES DEPTH IN THE SMALL SPACE. Commercial Bathroom Remodel. 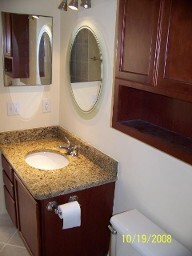 This is the clubhouse bathroom at Bradbury Park Homes Condominium Association. These two bathrooms were taken to the studs and concrete floor. Since the toilets and showers we to be relocated we had to remove sections of the concrete floor to run new piping. Wall were insulated and covered with moisture resistant drywall. The shower areas had Schluter Ditra installed for a mold free, 100% water proof shower that is backed by a 10 year warranty! 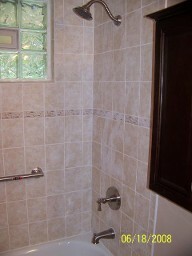 ADA (handicapped) Showers were created with fold down seats, Special floor drains at the openings that were custom made. ADA toilet stalls, hand dryers, sinks, and urinals were installed. Dimensions were held to the ADA guidlines for bathrooms. Central venting system to reduce the noise level in the bathrooms. LED lighting for energy savings. Every bathroom needs ventilation to prevent the accumulation of moisture and mold. If the bathroom is on an exterior wall, building code requires a window with an opening equivalent to 10 percent of the bathroom floor area. If the bathroom has only interior walls, the building code requires a fan with ducting to the exterior. What determines a bath type? 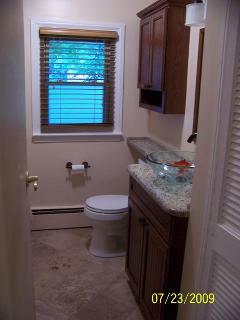 Full bath – Three or more fixtures including at least one lavatory, toilet and bathtub. Expect to see a showerhead over the tub. Three-quarter bath – Three fixtures including a lavatory, toilet and stall shower (but no tub). 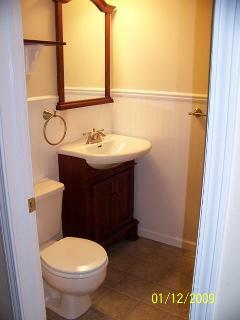 Half bath – Two fixtures, a lavatory and toilet. Powder room – A two-fixture bathroom located near the front entrance. Mud room – Same as a powder room but located by a back door or laundry.